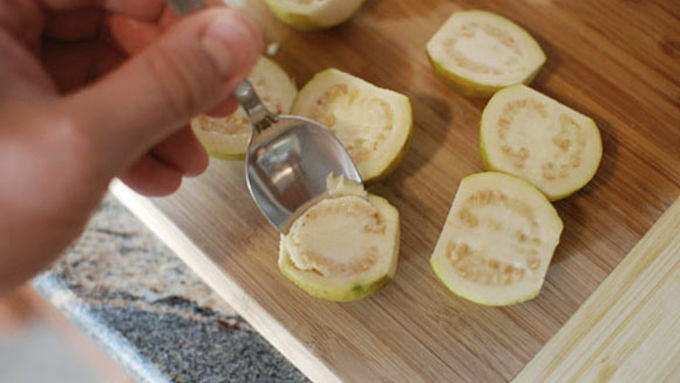 Cut your guava in half and remove the seeds with a spoon. If you cannot remove the seeds with a spoon, your guava is not ripe enough. Place the de-seeded guava in the blender with the skin on it. Add the rest of the ingredients and blend until smooth. If it is not thick enough, add some more ice. Pour into glasses to serve and garnish with more mint. I am lucky enough to live in a city where I have access to a wide variety of tropical fruit. I love everything about it! From the journey to the ethnic market hoping to find the right fruit, to the unveiling at home and trying to figure out just how to get at the good stuff inside, it’s an adventure I clearly have the taste for. 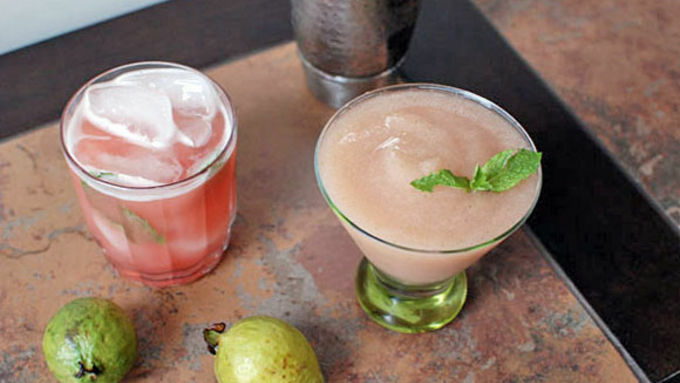 Today’s subject is the guava, and more specifically, two cocktails made with it. 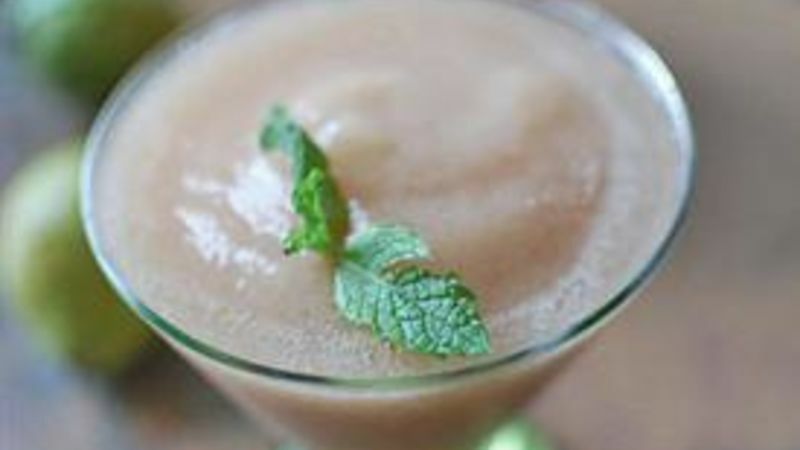 A Guava Basil Daiquiri made with guava nectar, and a blended Frozen Guava Mint Daiquiri filled with chunks of the fruit (which really hit the spot on a hot summer day). Some guava are pink on the inside, but many are not. If it is ripe, it should be very soft on the outside, like an avocado or mango would be, and give off a pleasant sweet aroma when you smell by the base of the fruit. My store also happened to have some small versions of the fruit. Scoop out the seeds of the guava with a spoon. If you can’t do this with a spoon, it’s not ripe enough. 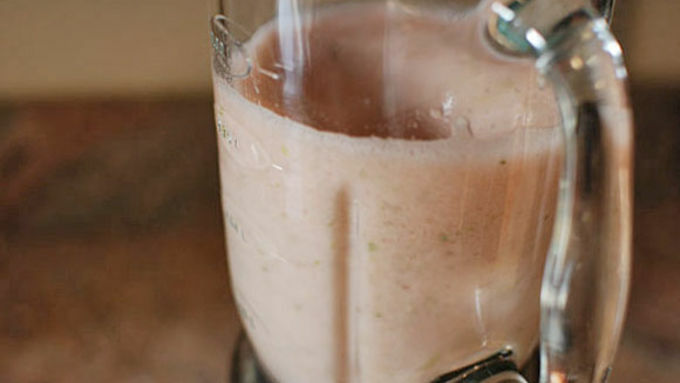 A little guava nectar goes in the blender with the chunks of fruit, ice, and alcohol. I can find guava nectar at almost any grocery store either by the juice or in the Spanish section. It’s usually in a carton. Finally some mint to finish it off. Give it a good spin in the blender until it’s very smooth. Then just pour and enjoy! Garnish with a fresh sprig of mint. The other drink is much easier – I didn't even bother taking any process pictures! Just mix the guava nectar with some rum in a shaker and pour it into a glass with ice and basil. If you can’t find ripe guava where you live, you can still make the rocks version I have shown here, orrrrrrrr you can (sneakily) substitute 1 pear and 1 strawberry into the blender with the guava nectar instead of an actual guava. Your friends won’t notice the difference! More Guava Recipes Turn this sweet little fruit into even more tasty treats.